Originally posted at LP on February 23, 2007. For the third consecutive year, LP has managed to convert your generous contributions into study material (book boxes) for Lao kids. Thanks to our donators who managed to contribute $805 to the fund, we were able to deliver 4 (!) book boxes through the National Library of Laos. 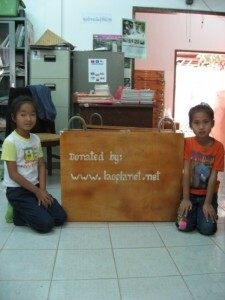 This month, Darly visited the National Library of Laos while she was on vacation in Laos. On February 5th, she arranged that the book boxes are scheduled to be compiled and distributed. She met in Vientian with Mrs. Kongdeuane Nettavong (a Nobel Peace prize nominee in 2005). Kongdeuane Nettavong was born in 1947 in Muang Chiang Kwang, northern Laos. After finishing her secondary school in 1970, she went to Laval University in Quebec, Canada for her Bachelor’s Degree in Geography, then to France in 1973 for her master’s degree in Archives. She has pursued a literacy program for the Laotians by setting up libraries, publishing books in Lao and encouraging people to read. She has been Director of the National Library of Laos since 1989. We think the book box donations are in good hands with Mrs. Nettavong. Many thanks to all the kind and generous LP donators who contributed to the project. Your contributions added to the education of Lao kids and this is very important for a prosperous and healthy future of Laos. Please check out more photos from Darly’s visit to the National Library of Laos below.